Meet my favourite toys – my boards. If you want to surf you need a board. Well, unless you bodysurf you get away without one. I’m the proud owner of five ½ of them. ½ because it’s my old flattie’s and she never got around to pick it up after she’s moved out. So it’s been living at mine too but technically is not mine. 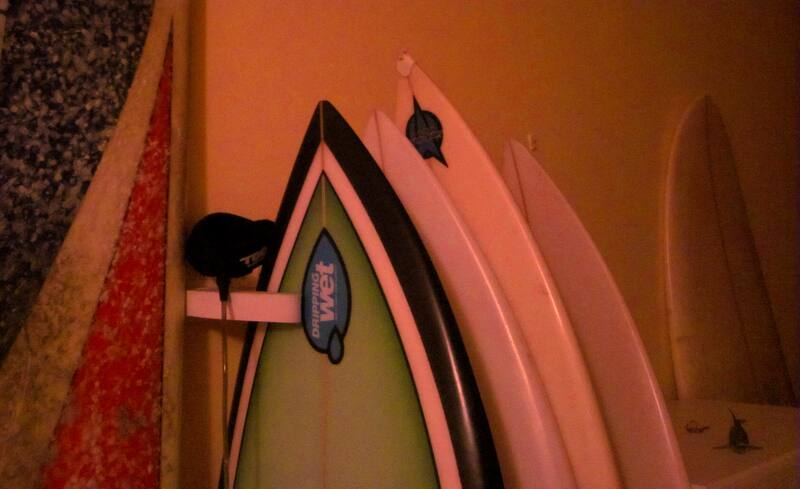 Either way, I have a nice quiver (that’s what surfer dudes and dudettes call their board collections). I’ll introduce all of them to you over time in toy stories. Maybe it even helps you when it comes to choosing an addition to your own quiver. Meet Bruce first. Bruce is my longboard. Bruce is massive. He’s about 8ft 6 tall 22 inches wide and 2’’ 9/8 thick. I have to say it was not love at first sight. I’ve only surfed short boards until I got Bruce and in fact I got quite annoyed with the longboarders in Bondi who always catch the waves way out the back with no chance in hell for any shortboarders to catch a wave on a busy day. By the way don’t even bother to go for a surf when the longboard comp is on in Bondi. Chances to catch a wave are quite slim unless you are on a mal too. It’s quite different to a shortboard and it took a few session to get the hang of it. When I did, I absolutely loved it. It so much fun on small days or when the waves are extremely fat and hard to paddle on to. Surfing on a mal is super cruisy and makes small days fun. Even if it’s super tiny and most surfers would not even bother, you can catch waves on a mal and just be playful. I usually fail miserably to hang 10 and stack it but it does not really matter because it’s so much fun trying. I’ve also heard riding a mal in between your shortboard sessions is good for your style. It loosens your upper body which helps you surfing other boards too. I would have never thought I would enjoy riding a mal so much. It’s a different style of surfing, super cruisy and relaxed. And if you are a beginner, you’ll have so much more fun riding a longboard as it’s so much easier to catch a wave.